Día de los muertos @ TANA, Nov. 2, 5-7 P.M.
On Saturday, November 2nd from 5-7pm, TANA Welcomes all interested community members, students, and TANA participants, to this year’s annual Dia de los Muertos event. 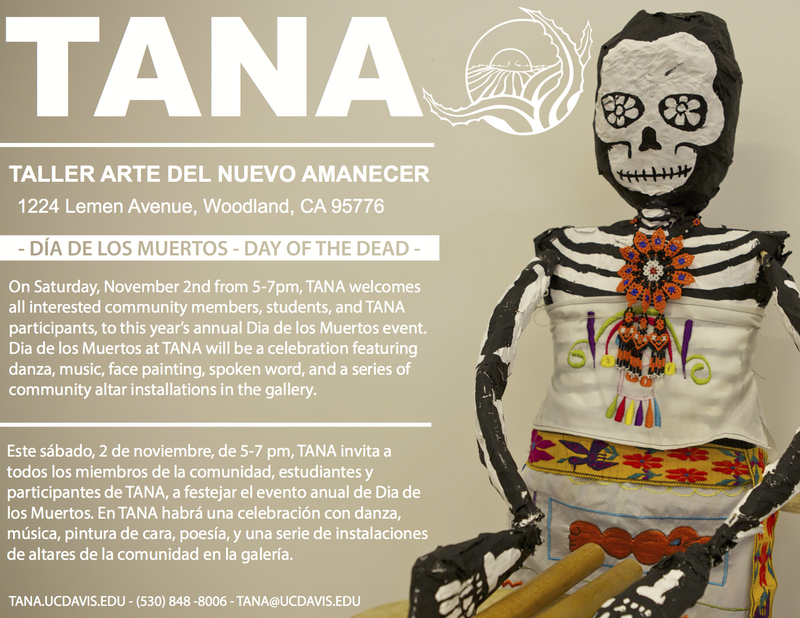 Dia de los Muertos at TANA will be a celebration featuring music, spoken word, and a series of community altar installations in the gallery. Juan Carillo, longtime cultural worker, activist, and Royal Chicano Air Force member will serve as Master of Ceremonies, sharing a rememberence of the late Jose Montoya. Poets Joseph Rios and Javier O. Huerta will be reading from their recent publications and providing some background on the influence of Jose Montoya on several generations of aspiring Chicana/o poets. Joseph Rios was born and raised in the Central San Joaquin Valley. His chapbook “shadowboxing” is forthcoming fro Achiote Press. His poems have been published in New Border, Poets responding to SB1070, BorderSenses, and elsewhere. Recently, he was a finalist for a Willow Books Literature Award. He studied literature at UC Berkeley and Fresno City College. Javier O. Huerta is the author of American Copia: An Immigrant Epic (Arte Publico 2012). Currently he is a doctoral candidate in the Department of English at UC Berkeley. Rudy Cuellar, longtime Royal Chicano Air Force member will have an interactive screenprinting installation for guests. TANA will be providing food for all attendees. We look forward to seeing you at this year’s event.